Gangsters Out Blog: From Flanders Fields in France to Opium Fields in Afghanistan: Maggie, what have we done? From Flanders Fields in France to Opium Fields in Afghanistan: Maggie, what have we done? Flanders Fields is a famous patriotic poem about poppies growing in the spring of 1915 on the battlefields of Belgium, France and Gallipoli. The medieval County of Flanders spans the southern Belgium and north-west France. The symbol stirs us to remembrance, mourning and duty. Today I was speaking with someone who works in a local grocery store. They said there was an announcement over the PA at 11:00 AM that called for one minute of silence. One of the customers said what's the matter did the computer freeze? No we're having a minute of silence for Remembrance Day. Are you kidding me? It reminded me of a moving song and video by Terry Kelly called A Pittance of Time which one blog reader recently just sent me. Is it really that hard to stop for one minute and remember the great sacrifices made on our behalf for the freedom we now enjoy? Yet others understandably have mixed feelings about war and glorifying murder. One blog reader wrote a post in their blog about how they're not wearing a poppy today out of remembrance of the civilian casualties of war which one source claims is a 10:1 civilian to soldier loss in war. Then there's the politics of war. Self serving politicians and war profiteers exploiting the moment. Peter McKay's publicity stunt in Kandahar comes to mind. Of anyone Stephen Harper and Peter McKay should be hanging their heads in shame on Remembrance day not exploiting it for a photo shoot. I remember reading a news release about some vets being offended by a cartoon about glorifying murder. They said if you oppose the mission in Afghanistan blame the politicians don't blame the soldiers. Yet at some point our duty is to doing what's right not doing what we're told. Cultivating and harvesting Opium in Afghanistan mocks the sacrifice made in Europe in the great war. If there really is such a thing as a great war. As Yoda once said Wars not make one great. It reminds me of the movie Passchendaele written, performed and directed by Paul Gross. It's a story about his grandfather's experience in World War I. It became a love story which in turn was how my own grandparents met. My father's father was wounded with mustard gas burns on his back and met his future wife who was a librarian from New Brunswick serving as a nurse in England during the war. I remember seeing a building in Vancouver near the arts centre with a statue of what I thought was a nun. Turns out that was the uniform of a nurse during the war. In an interview about the movie, Paul Gross recounts a heart wrenching story his grandfather told him about the war. He said his grandfathers patrol as taking heavy sniper fire from the enemy. There were many casualties but they finally broke through. His grandfather came across one wounded German soldier who was just a kid who reached out his hand and in broken English with childlike innocence said "camera"? He claimed the Germans heard that the allies had cameras and were intrigued by them. After incurring all that loss of his patrol he explained how he then raised his rifle in the air and drove a bayonet through the child's skull ending his life instantly. He said that memory haunted him ever since. It's a stirring message we don't normally hear. The humanity of war. All the torture, oil wars, war profiteering and opium production has clearly tainted modern warfare. It's not so clear cut good verses evil any more. There's a lot of blurred areas that call upon our duty to stand up for what's right. Torture is not right. Invading a country for oil is not right. Smuggling cocaine to raise money for war is not right. In Flanders Fields, it says take up our quarrel with the foe to you from failing hands we throw the torch. 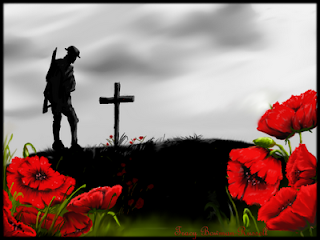 If ye break faith with us who die, we shall not sleep though poppies grow in Flanders's fields. The Afghanistan mission has broken faith with those who died in Flanders despite the fact that we have lost many very good, sincere and genuine soldiers there. The invasion of Iraq was completely wrong. Doing our duty means honouring the dead by doing what's right. Not by exploiting them for a photo op to promote war profiteering. Maggie, what have we done? What happened? What happened to the post war dream? Mind how ya go. Take heed of the Dream. Our World has become a very sad place to be, How do we Change it? Where do we start? Who will Listen to us? Scream for Change too Loud and we get thrown in Jail, or Psych ward! Indeed. I guess allowing the discussion is the first step. I was speaking with a patriot at the George Bush demonstration who said anyone trafficking heroin should be shot. 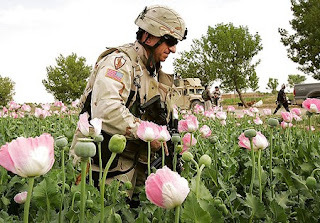 I said did you know the US military is now helping the farmers in Afghanistan cultivate and harvest opium. He didn’t believe it. The 9/11 truthers have megaphones and keep screaming 9/11 was an inside job over and over again. I can see how it gets irritating but if you think about it, if 9/11 really was an inside job wouldn’t you want to scream about it? Paul Gross came up with a very interesting statistic. He said Canada sent ten percent of it’s population to war in WWI and one in ten of those soldiers died. Canada was profoundly involved with that war and remembering that heritage is important. Yet ignoring Operation Northwoods and the dark side of the new wars is irresponsible. oh I know, I often wonder what the old time Vets think about with how the world has turned out today. they fought for so much and none of us learned. Agent K: I too have heard quite a bit about the inside Job of 9/11, it is mind blowing. Several Years ago, the late 70's I believe, I had heard a ex FBI agent speak under-cover, he said "if the general population really knew what was going on behind the scenes there would be massive suicides"